Tuesday evening and overnight it will become dry with some clear spells breaking through, but there will also be areas of mist, fog and low cloud forming, especially during the early hours. On Wednesday, early areas of mist, fog and low cloud will lift and break during the morning to leave a dry and fine day with long spells of sunshine. Feeling warmer. Jersey's firefighters have overwhelmingly rejected a pay offer from the States. The Fire and Rescue Service Association says 84% of its members took part in the poll, with each person turning down the three-year deal. It adds the pay dispute will now be taken to a two-year arbitration process for the 2018 and 2019 offers. One-hundred-and-fifty houses could be built in St Sampson at the Saltpans site. 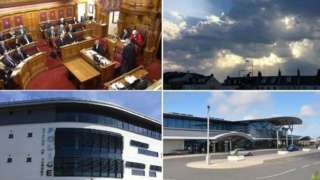 It is one of two plans that have been prepared for potential development in Guernsey. Five to eight houses could also be built at Quantock Cottage at Sandy Lane. Islanders can give their views on the plans until 28 May. Jersey fire crews stayed at a St Helier pizza restaurant for most of Monday evening to dampen down hot spots after a large blaze. Pizzeria Romana in York Street was destroyed by the fire, which started just after 14:00. Officers are now making the building safe before it can be inspected by structural engineers. Station commander Michael Baudain praised his crews for saving the surrounding buildings. We've managed to save two properties either side of the fire and the properties at the back. We'd like to thank the public who were able to evacuate the building, and especially the general public who were very helpful in staying away from the fire." No-one was hurt and fire officers are investigating the cause. More than 1,000 footy fans were in attendance this weekend as Guernsey FC picked up a 1-1 draw against Greenwich Borough. Only one team will be relegated from the Isthmian Sout East division after the folding of Thamesmead Town earlier in the season. It's now a straight fight against Greenwich for survival, with both teams level on 29 points, but with Guernsey having played one fewer game. GFC's Communications Manager Nick Legg said more people would come to the stands when they brought in some wins "to join the core fan base who have helped us through some tough times". It's still unclear why the president of Guernsey's planning authority resigned from the role. A representative from the Bailiff's office confirmed it received a resignation letter from Deputy John Gollop. Deputy Gollop has led the Development and Planning Authority since the start of the States term in 2016. Vice-President Dawn Tindall said it was "no surprise" to her but she's sad to see him go because he was "a fantastic president who put his heart and soul into the job". The BBC has made repeated attempts to contact Deputy Gollop but is still awaiting a response. Members of a Jersey teachers union will strike for eight days in their ongoing pay dispute with the States. The National Education Union wants members in all primary and secondary States schools to walk out over four weeks in May. The union says the board which sets civil servants pay isn't budging - and teachers effectively have a pay cut of 3.5%. Members who teach Year 11 and 13 are not expected to strike so there is no disruption for pupils' preparation for exams. The States Employment Board said it's "extremely disappointing", and has urged teachers to reconsider their action. Mostly cloudy this morning with a little patchy light rain or drizzle possible, especially at first. It will then become mainly dry with sunshine breaking through this afternoon. This evening it will be dry and fine with late sunshine. Tonight it will remain dry with clear spells and areas of cloud.